The very last hunt of 2016 was late in December with a very special Warrior. We had the pleasure to be a part of this buffalo harvest with Bo Reichenbach. Bo is a retired Navy Seal who was wounded in combat much like all of our Wounded Warriors. 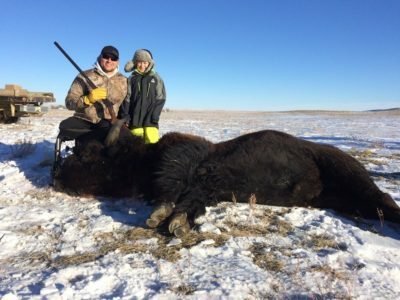 For this trip, Bo got to go to the Ten Springs Ranch in Molt to harvest a beautifully HUGE five year old buffalo bull on a very cold windy day. Bo was able to bring his son along to share the experience and cold with him as well. 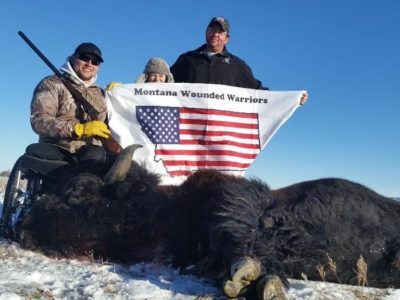 Bo was using a custom Sharps 45-70 single shot rifle provided by a great supporter of Montana Wounded Warriors, Jim Johnson. This very large and tough animal and literal shook off the first shot to the head and walked off and continued to graze. Bo took another well placed shot and dropped the bull in his tracks. 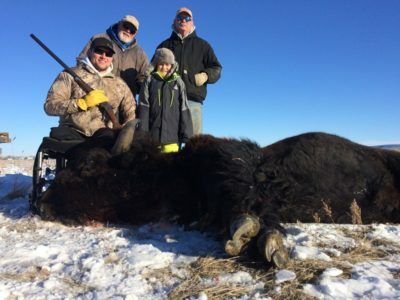 This was a very special and well deserved buffalo for Bo and his son to share together and we could not thank the Ten Springs Ranch enough for this experience. 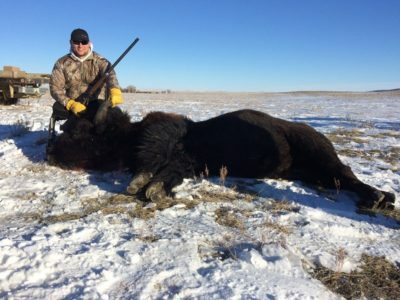 Bo took a beautiful trophy buffalo and we even had a great taxidermist on site to help dress the animal for a mount, thank you Jim Howe. Bo took home a massive amount of meat for his family and a trophy animal with memories to hold forever. 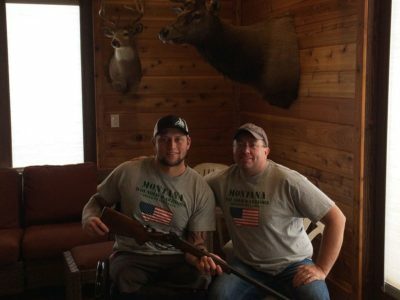 Later after the hunt, Jim Johnson, donated a custom Sharps Rifle to Bo as a thanks for his service and sacrifice. Thank you so much Jim for everything and thank you Bo for a great trip with you and your son.